Check out the sculpture in Rotary Park, near the O.O. Madsen Bridge and Tiddalik. There’s a new landmark set to catch the eye of Warwick visitors heading into town over the O.O. Madsen Bridge. Killarney sculptor Paul Stumkat’s ‘Murray Cod’ sculpture was unveiled this week just on the eastern side of the bridge in Rotary Park, next to the highway and near Tiddalik. The dazzling marble sculpture depicts a ‘breeding pair’ of Murray Cod – an ‘apex’ species of the Murray-Darling river system which, in case you didn’t already know, starts in the range above Killarney at ‘The Head’. 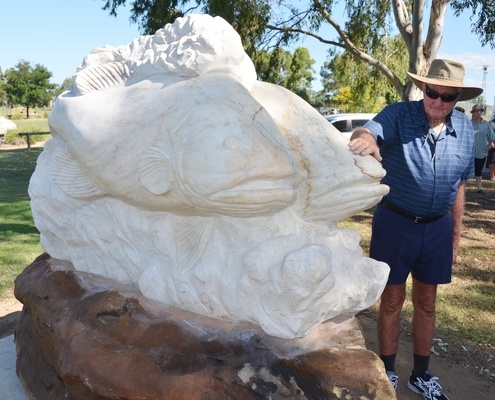 The sculpture was funded by the Southern Downs Regional Council and the Queensland Government, and acknowledges the 30 years worth of volunteer work – and Murray Cod fingerlings – put into the Condamine River locally by the Warwick District Recreational Fish Stocking Association. The stretch of the Condamine near the O.O. Madsen Bridge has been a major focus of the Fish Stocking Association since 2013, and is now known as the ‘Warwick Murray Cod Rehabilitation Reach’, with ‘habitat structures’ in place to encourage Murray Cod breeding. Marble for Paul Stumkat’s Murray Cod sculpture came from the Sibelco quarry at Elbow Valley east of Warwick. Paul split the six-tonne block over the course of a week and worked on the cod pair for around six months, using a combination of pneumatic drills, angle grinding and hand chiseling to fashion the fish, which have a highly-polished finish. The sculpture was officially unveiled by Mayor Tracy Dobie on Wednesday. Next articleWhat’s that? Rain on the roof?